There are 15 images tagged with “fall”. A walk in the birch woods. I created this for an Autumn Colors 3D landscape contest. I used a different method of rendering the lighting which took longer to calculate (basically that&apos;s what 3D rendering does, the software calculates the light that would come from every point of the scene through the virtual camera lens), but I loved how warm and soft it made the scene. It looks nice for a picture, but it&apos;s a pain when you&apos;re out walking! This took over a week to render (at a larger size than this), mainly because of the blurring. This is what you get when you lie on the bench watching the “Clouds Go Sailing By”, instead of mowing the grass! Just a simple fractal that I thought looked like a sheaf of harvested grain. Or you might see one or more faces in it - I guess it depends on your imagination! 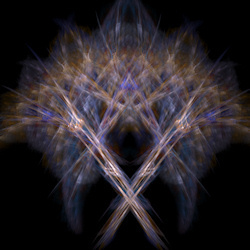 This was one of my early fractal designs, in this case with very little editing. It was created with the Apophysis fractal flame creater/editor. 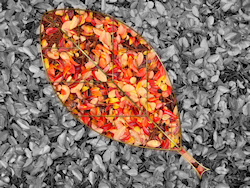 This pictue from 2009 is from a photograph of some crepe myrtle leaves on the ground. It's weird how the weather affects the fall colors. A tree that I photographed in brilliant color the year before declined to put on any display the next year, but the crepe myrtles I had never noticed in the fall were all red and gold. I missed getting them while the leaves were still on the trees, so I had to shoot them on the ground. Then I added a filigree design to emphasize the leaf shapes and colors more.